Here comes my absolutely favorite recipe of all time. If anyone asks me what my favorite food is, I’ll always say it’s Königsberger Klopse. Outside of Germany almost nobody knows this dish. It’s a very traditonal and old German recipe. It’s definitely comfort food and goes perfectly with the fall and winter seasons. We usually eat it with boiled and salted potatoes and in some housholds rice is eaten with it as well. The meal is named for the Prussian city of Königsberg. 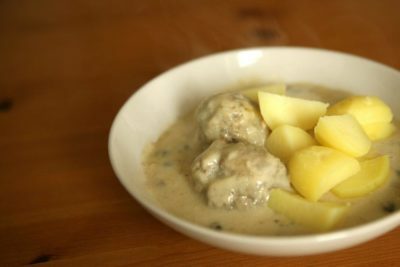 The meatballs in this recipe can be made from minced veal, though we often substitute it for less expensive beef or pork. For the meatballs sauté the onion first and let it cool. If you use an old roll just place it in some warm water to soften. After it has soaked up the liquid just squeeze it out and add it to the other ingredients. If you use anchovy filets you have to chop them before putting them in the mix. Put all of the meatball ingredients into a bowl and mix well. Form about 12-15 meatballs out of it. It’s important that they all have the same size. Melt the butter in a pot, and carefully stir in the flour. Slowly blend in 2 cups of hot water. We called it a Mehlschwitze. It’s the base for a lot of different dishes like my Senfeier Recipe. When the water is all stirred in you should end up with a creamy basic sauce. Add the raw Meatballs and let it simmer for about 15 minutes. Take out the meatballs and add the capers with the juice they come in, broth, lemon juice and the spices to taste. Blend about 3 tablespoons of sour cream with the egg yolk. Stir the mix into the sauce, making sure it’s thoroughly blended in. The sauce it not allowed to be cooking while you add the mixture or otherwise it would not dissolve well enough. Now add the meatballs back into the sauce. Serve it with some boiled potatoes which you can sprinkle with some fresh parsley and you have a hearty traditional german dish perfect for the cold season coming up. The meatballs are tender and full of flavor. We usually eat the biggest meal of the day for lunch but it also works perfectly for dinner. Enjoy! There are different ways of making Königsberger Klopse. Another way is to boil the Klopse first in a bone broth and than use that broth to create the sauce. In my family we don’t cook Königsberger Klopse like that because first of all this is how my family has handed down the recipe for generations and also it’s way faster if you cook the Klopse in the cream sauce. The flavor will be the same in the end anyways. With this Blogpost I participate in the Blogparade „Kulinarisch um die Welt“ from Lavendelblog. Where she asked Bloggers to write down their favorite main dishes from all over the world. That looks wonderful! I’ll have to try it this Autumn! Schön, dass du bei unserer Blogparade dabei bist. Vielen Dank für das Rezept.